"People have been kept hostage for the deeds of the government"
The America Team for Freedom for Eritrea was saddened when the stunning news of the massacre of Eritrean youth by the Eritrean regime was posted in some opposition websites. This incident, added to various other allegations of massacre and atrocity in the past, initiated that action be taken to find some reliable sources that could verify that such things are really taking place in Eritrea. Fortunately, our team members met and talked with two Eritreans who came to the United States recently. One of the individuals is a regular citizen of Eritrea who got an opportunity to come to the United States as an immigrant. The following is a brief account of his recent experience in connection with his travel to the United States. For the safety of the innocent, his name and certain other particulars are not included. His replies to our questions follow. We welcome you to the United States. How does it feel, being in America? It is too early to give opinion about life in America and I can’t think of some common denominators between Eritrea and America to compare them. However, let me just mention one point. In America, nobody asks you any questions wherever you go whether it is at night or during the day time. So far as you respect the law and behave the right way, there is no limitation to your movement. In Eritrea, a person between age 18-54 (18-27 for females) is required to have a movement paper anywhere, anytime. If a person of this age cannot show his movement paper when asked, he/she would be arrested immediately and only God knows where they would end up. What is a movement paper? As everybody knows, the Eritrean people have been kept hostage for the evil deeds of the government since the Badme war with Ethiopia. The youth have especially been the victims of this situation. They are forcefully conscripted for the so-called National Service. Once assigned to an army unit or any government job, they are not allowed to move from place to place without a paper issued by the ministry of defense. The purpose of this paper is to control activities of the people of this age and make sure that everyone in this age category is serving the government. You also belong to this age group. Did you have a movement paper and how did you manage to leave the country? I had a medical certificate that stated that I was unfit for the service. So, I did not need to have the movement paper. But when later on I got the chance to come to America and began processing, they said that I must go to the ministry of defense and get a release for that purpose. I was sent to a military camp where many youth (people in the 18-35 years age group) are languishing in jail. I was not jailed but I was instructed to start the medical evaluation process all over again to prove that I am unfit for the service. This was going to be a lengthy process as my trip to America was time-sensitive and I had to act fast. I was running out of time and the more I spent time there, the less likely I would be able to come to America. Besides this, there was no guarantee that a proper medical process could take place. So, I decided to cross the border to the Sudan. So, it took me about 10 days to reach Khartoum. After staying in the Sudan for a while I had to go to another country where I could get access to an American Embassy and with a processing time of no more than a week, I got my visa and here I am. Wasn’t there a means to get your medical documents in Asmara with the help of some money? You know that money can do anything in Eritrea today. If you can get the right middle man, there is a chance that they may bring whatever you need to your home. They can make every arrangement for anybody if you can pay a substantial amount. But knowing close friends or relatives of concerned officials is necessary. This arrangement takes a while and in my case time was a time factor. It is not hidden from our people that the corrupt Eritrean officials are running after money. It looks like they understand that change is approaching and everyone is crazy about accumulating as much [money], before it is too late. It is this competition among the authorities that is resulting in the death of their civilian collaborators such als Fikre and Samson. How doy you feel about your experience of crossing the border to the Sudan? Primarily, I hope the world knows that thousands have crossed over to Djibouti, Ethiopia, Sudan, Yemen and Saudi Arabia due to the regime’s policy of brutality. Some of these poor souls have even gone to many other countries which are not immediate neighbors of Eritrea, by land or by sea. Today you find these folks in Egypt, Israel, Uganda and Kenya, some of them after passing through a bitter experience of crossing the Sahara and the Sinai; and still many others have made it to Europe after crossing the Mediterranean Sea. No matter how hard it was, the lucky ones have reached countries of peace, law and freedom. However, the bad thing is that some contries, including Egypt, Libya and Malta, have acted inhumanely by deporting Eritreans back to the detestable regime. It is not just deportation that Eritreans face. Many risk their lives, too. Some are caught by People’s Front for Democracy and Justice (PFDJ) security forces and disappear with nobody knowing their whereabouts. The worst scenario is that some are killed on the border. For a long time now, the government has instructed its security forces to shoot anybody found attempting to cross the border. This was the most disgusting thing to see when crossing to the Sudan. After arriving in the Sudan, compatriots who took different routes to cross the border met and discussed our tough and risky journeys. Some had to tell stories just too hard to believe. Seeing the remains of killed people (male and female) at the border was the worst experience. The dead bodies are on the ground only to be eaten by hyenas. In some instances it also appeared that some people were under threat from wild animals when trying to change routes to avoid places where the government security forces could possibly be encountered. This may also happen due to lack of food and water when people have to spend more time hiding themselves in the wilderness when and if the routes are too risky to cross. So, crossing a border is a fight both against the PDFJ and natural threats. If it is that risky why should people leave their country? Basically, most people agree that Eritrean independence has been betrayed and that the promise for the long anticipated democratic governance is broken by the group in power. Our people are under a cruel, suppressive regime which is even worse than the external forces who ruled the country during the colonial days. This is a government that intentionally starves its own people. It is a government that denies access to donor governments and organizations who are ready to help the country with food and other basic necessities. It is a regime that arbitrarily kills and arrests people. It is a country led by the whim of a dictator. The security system is so tight such that even talking against the regime is considered a top crime. Thus, people cannot tolerate such a regime. 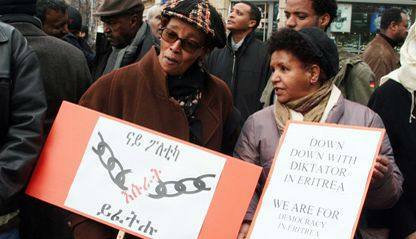 Since dissent is impossible and no space exists for fighting the regime inside the country, Eritreans find it preferable to leave the country and do what they can do from outside of the country. Thank you for your willingness to share your thougts and experiences. We may come to you another time with some more questions. The America Team for Freedom for Eritrea: An Eye Witness from Eritrea, Interview #1. 16. Februar 2009. http://www.freeeritrea.org/files/EyeWitnessReport-1.pdf.